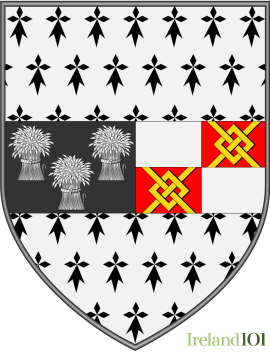 Kilkenny is Ireland's party county. 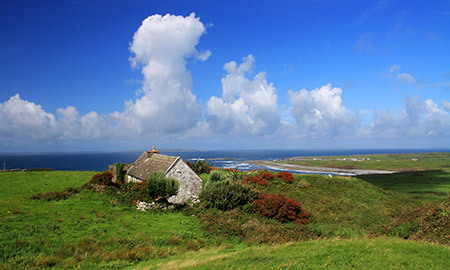 Famous for two beers: Smithwicks and Kilkenny, the former of which is an Irish red ale that was first brewed at St. Francis Abbey Brewery in the 14th century. 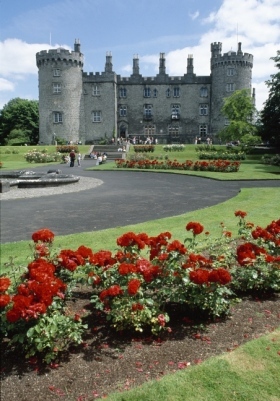 Located in Kilkenny City, the abbey's "Smithwicks Experience" is now a popular tourist attraction. 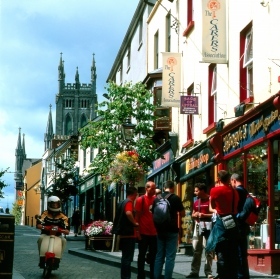 Kilkenny City also has more than its share of friendly pubs, which contribute heavily to the county's reputation as a great place to go out drinking. The locals' cheerful demeanours don't hurt, either. And with all that drinking going on in Kilkenny, it is also no surprise that the county is positively stocked with artists, craftspeople and comics, hosting the likes of the Cat Laughs Comedy Festival, Rhythm and Roots Festival and Kilkenny Arts Week every year. 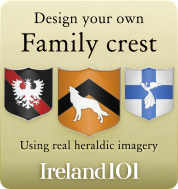 Among Kilkenny's most popular attractions are the 12th century Jerpoint Abbey and Kilkenny Castle, and the 13th century St.Canice's Cathedral, named for Kilkenny's namesake, Saint Canice. 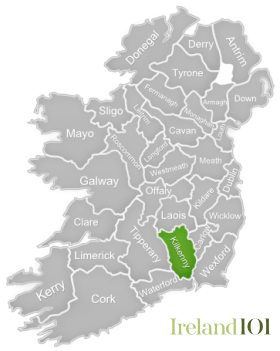 This mild, southeast county is one of the few Irish counties with no sea coasts, although Kilkenny enjoys plenty of water thanks to its "Three Sisters" The rivers Nore, Barrow and Suir, which flow through Kilkenny, the latter two forming its east and west borders respectively. Much of Kilkenny's landscape is marked by lumbering, green hills and low valleys that offer fantastic walks, including the South Leinster Way, which follows the River Barrow through forests, beside ancient abbeys and over historic stone bridges. 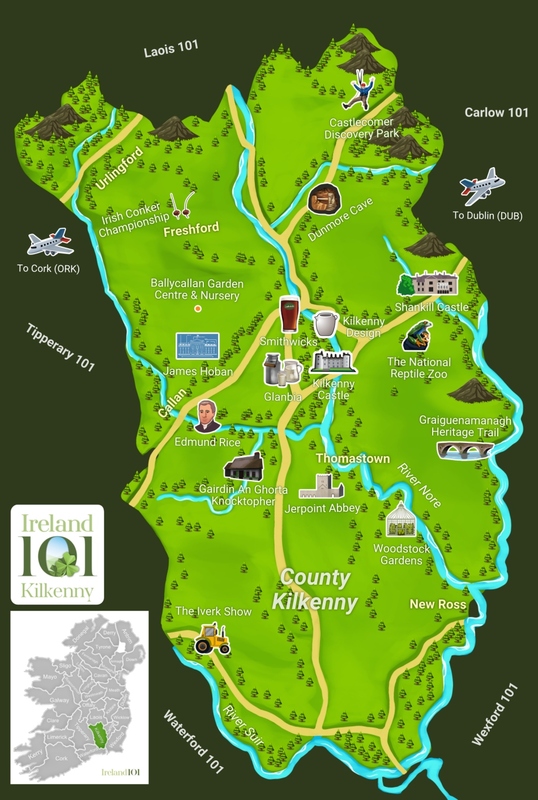 Kilkenny's highest peak, Brandon Hill, ascends more than 500 metres above sea level, offering stunning views. Golf is also understandably popular in Kilkenny, especially at Mount Juliet Golf Course in Thomastown, which was designed by Jack Nicklaus. Likewise, fishing on the River Nore and rowing and boating in the scenic (but entirely unpronounceable) town of Graignamanagh are popular pastimes here. 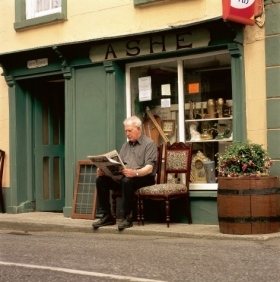 Few people leave Kilkenny, a nod to its warm, fun personality, but the county has produced a few famous names. Among them, James Hoban - the architect who designed the White House - was raised in a thatched-roof cottage in the village of Cuffesgrange. And famed Irish novelist, Jonathan Swift, attended Kilkenny College, along with philosopher George Berkeley, whose name is commemorated by a city in northern California and its resident university, UC Berkeley. 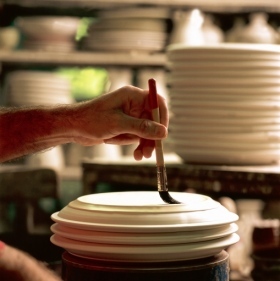 Craft worker at Stoneware Jackson Pottery Inistioge, Kilkenny. 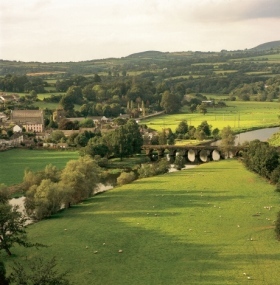 Inistioge looking down on the river Nore, Kilkenny. 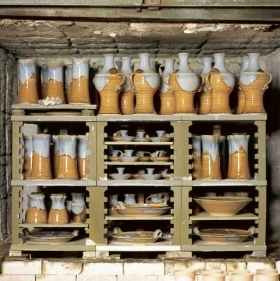 Stoneware Jackson Pottery, Inistioge, Co. Kilkenny. 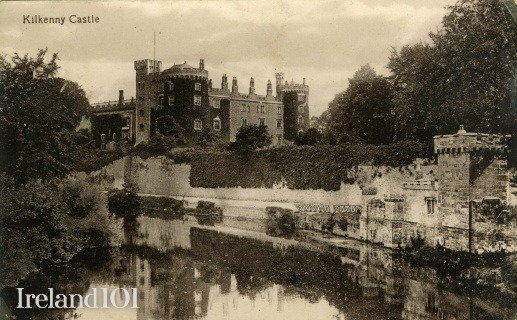 How much do you know about Kilkenny? 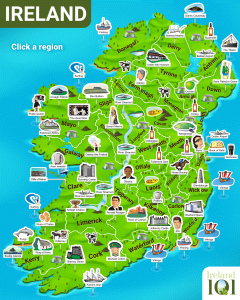 How much do you know about Kilkenny ?